AIRPORT, St. Eustatius, July 12th 2009 – On Saturday, July 11th 2009, the Aviation Pioneers of the Caribbean Foundation elected a new Board. Terrance Rey was elected as the new President, taking over from Elizabeth (Elly) Delien, founder of the Foundation and partner of Winair’s legendary pilot, the late José Dormoy, affectionately known as “Pipe.” Rey is managing director of AirStMaarten, a company specializing in organizing private charters to and from St. Maarten. Walter Hellebrand, historian and communications professional, was also newly elected to the board and will take on the role of Secretary. Elly Delien stays on as member of the board in the capacity of Treasurer and the Board’s former secretary Nyna Burright, a shipping coordinator working for St. Eustatius Port Services, was also reelected. She will act as substitute secretary. 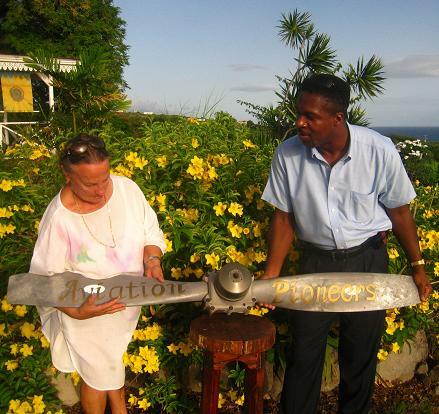 The Foundation was established on February 12th 2008 by Elly Delien to preserve and promote the history of aviation in the Caribbean - in particular in the Windward Islands – and to pay tribute to the pioneers who opened up the islands to the outside world and thereby played an important role in their development. Some of the ways by which the Foundation tries to achieve its purpose include research and exposure of the history of aviation as well as projects to create more interest in the aviation history of each individual island. When José Dormoy passed away in 2007, Elly Delien was left with a virtual treasure chest of documents, information and images relating to the early days of aviation in the Windward Islands, an eventful past in which her partner of many years played a very active role. She thought “Pipe’s” personal archive would make a valuable beginning of a collection of information about the history of aviation in the islands that was worth sharing with everybody. She therefore decided to start the Aviation Pioneers of the Caribbean Foundation. In its first year, the Foundation’s sizable archive was inventoried and organized. Also, displays commemorating the aviation pioneers were arranged for Saba’s airport and Winair’s sales office in St. Maarten. The Foundation has a number of projects underway set to launch in August and November of this year and, with the new team on the Board, expects to initiate several more to highlight the pilots who opened up the sky for the northeastern Caribbean islands. Elly Delien expressed her thanks to all the former board members for their assistance with the establishment of the Aviation Pioneers of the Caribbean Foundation and especially acknowledged the support of Claudie Banare; film maker Pierre Brouwers, Jerry Casius; Leontien Durby; Michael Ferrier; Faustin, Denise and Robert Ledée; Michel Martinon; AirStMaarten, Mazinga Giftshop and Xerox. The Board would like to encourage everyone with stories, material or images relating to the history of aviation in the northeastern Caribbean to contact the Foundation so that scans or copies can be made in order to increase the knowledge of its fascinating development. A monetary contribution can also be made to the Aviation Pioneers of the Caribbean Foundation via Paypal.com. AIRPORT-- February 2009. Several workers of the Windward Islands Airways (WINAIR) will be greeted with sad news today as management of the company plans to inform them via a memo of its intention to cut jobs as they already began cutting back on some of their destinations due to the global economic crisis which continues to affect a number of local businesses. It is understood that due to the global crisis the company is facing a number of challenges which led to the steps that have been taken by management. Some of the routes that are to be affected are Dominica, Tortola, St. Kitts and Nevis. The airline stopped all flights to Dominica and Tortola on March 1st while the remaining routes will halt by March 29th. Due to the cuts some 20 persons are expected to loose their jobs including twelve (12) pilots and eight (8) ground crew members. It is understood that management attempted to save the routes as well as the jobs but government at some of the destinations had refused to assist the airline which resulted in the present situation. Air Jamaica announced earlier this year that they were going to cut some 600 jobs while LIAT has already began reducing flights out of Guyana, Antigua, and Barbuda, Barbados and St, Kitts and Nevis, but so far they have failed to say how many people are going to be under the razor. With this announcement Winair would be the latest airline to take these decisions if they are to continue doing business. While the global economic crisis has affected all cross-sections of businesses and in the tourism sectors Winair is no different. It is understood that the routes that are now being affected was not doing well and the company was working at a loss since the governments of those islands refused to share the burden even though they want the airline to continue its operations. With these drastic cut backs Winair would only be servicing eight destinations. Effective January 12th, 2009, all travelers entering the United States through the Visa Waiver Program are required to obtain an electronic travel authorization prior to boarding a US-bound flight. If you are a passport holder from a Visa Waiver country, please visit the US Electronic System for Travel Authorization at https://esta.cbp.dhs.gov at least 72 hours prior to departure. The site is available in several languages; however all responses are required in English. Registration is free, is valid for up to 2 years and does not require your flight information if you have not booked. If your passport country requires a US visa, this registration is not required. For more information, please visit http://www.cbp.gov. ST. EUSTATIUS, November 10th, 2008 -- The possibility of a new commuter airline offering flights to St. Maarten and later to other islands is being investigated on Statia. Last week, the directors were granted a business license by Statia's Executive Council. This is the first step, and it enables the directors to pursue further licensing and approval at the federal level. The new airline, to be named Air Statia, will be based at Statia's F.D. Roosevelt Airport and will, as far as is possible, be owned and run by Statians. It will be operated Statia Air Services NV. Air Statia expects to begin offering flights by early 2010. "It takes that long to begin service, because we must build a hanger, acquire our airplanes, hire pilots, engineers, and other employees, train our employees, and comply with numerous safety regulations," Director George Works said. Air Statia plans to fly Britton-Norman Islanders. The company chose the Islanders because they are well-suited to operate the short flights between Statia and neighbouring islands, and because they are more economical to fly and maintain than most other similar aircrafts. This is the type of airplane St. Barths Commuter Airline and Windward Islands Airways International (Winair) use in their operation. Over 750 of these planes are in commercial service all across the world. Three managing directors will organise the day-to-day operations of Statia Air Services NV. The managing directors will report to a managing board elected by the shareholders. The managing board will set the airline's policy and oversee its finances. The shareholders, as far as is possible, will be Statians and local Statia businesses. The managing directors are George and Shelley Works, and Erik Ward. George is a retired United States engineer who was Chief Engineer of a 40,000-person company providing technical services to the US Government and other customers. He is also a pilot. Shelley is a retired US engineering manager who managed over 100 engineers and technicians and developed the US national law enforcement records system. She is also a pilot. Erik Ward is a retired Canadian career pilot. He has flown for Air Canada, Qantas Airlines, Winair and others, in aircraft ranging from Alaskan float planes to trans-oceanic jets. It is planned that managing board and the shareholders will decide on dividend policy. The directors expect Air Statia will provide an attractive dividend return to the shareholders, while still retaining enough earnings to grow with Statia's transport needs. Statia Air Services NV shares will be offered for US $1 per share with an initial offering of about one million shares. St. Kitts, October 9, 2008 -- British Airways will be starting once weekly direct flights on Saturdays from London Gatwick (LGW) airport to St. Kitts (SKB) Robert L. Bradshaw International Airport with a 280-seater Boeing 777 effective January 2008. The strategy is to increase high end tourism travelers with the inclusion of 40 Club World class seats to help upmarket UK tour operators sell St. Kitts & Nevis. AirStMaarten will be providing connecting flights and charters from St. Kitts to St. Barths. Request here. BA flight 2157 will be departing LGW on Saturdays at 10:30am and arriving in SKB at 4:45pm. BA flight 2256 will be departing SKB at 6:15pm and arriving back in LGW at 7:10am on Sunday the next day. Book here. Curacao, October 2008 -- Inselair website is presently offline. Insel air is switching to a new internet booking reservation system. In the meantime, passengers can book all Inselair flights online via www.airstmaarten.com. In the event that flights are not bookable online, passengers can submit a reservation request here. AIRPORT--Montserrat residents and visitors can once again access the volcanic island by fixed wing air service with Windward Islands Airways Winair. The St. Maarten based company restarts scheduled service to Montserrat (MNI) today. The flight schedule logged into the booking system goes up until November 30, 2008. Further booking dates will be added during the coming weeks. Winair was the first airline to provide fixed wing service in 2005, when the new airport was opened. However, several months ago, the government opted not to renew its contract with Winair, choosing instead to work with Carib Aviation. This venture hit some snags and Winair was able to regain its route. Travellers booked on LIAT or Carib Aviation to travel to Montserrat from October 1 and beyond are urged by the island's tourist department to contract their booking source: travel agent, airline offices or airline website for refunds. SURINAME -- Surinam Airways, better known as SLM (Suriname Luchtvaart Maatschappij), will be offering flights between Paramaribo, Suriname, and Miami starting Monday, August 25th. After approximately sixteen years Surinam Airways has regained permission from the air transport authorities of the Unites States of America to operate flights into the USA. This joyful event marks the beginning of a new era in the regional flight operations of Surinam Airways. Miami, being a popular destination for many national travellers, can once again be reached without too many hardships. Meanwhile the flight schedule has already been published and our first flight will be on August 25, 2008. A commercial stop will be made at Oranjestad - Aruba. Surinam Airways has also obtained permission to carry passengers from Aruba into Miami. We guarantee that we will offer our customers a high-quality competitive product, enabling us to become the main player on the market. Philipsburg -- Suriname Airways (SLM) will be offering flights between Miami (MIA) and Paramaribo (PBM), Suriname, twice weekly on Mondays and Fridays via Aruba (AUA), where commercial stops will be made, meaning you can also book flights between Miami and Aruba and Aruba and Suriname with Suriname Airways. The fares averages about $800 for a roundtrip ticket from Miami to Suriname. For the route Miami to Aruba the average fare is about $300. Between Aruba and Suriname the average fare is about $500. You can make a reservation request with us here at AirStMaarten to fly with Suriname Airways (SLM) on the Miami-Paramaribo (Suriname) or the Miami-Aruba-Paramaribo (Suriname) routes. Click here. ANGUILLA -- Anguilla is one of the world’s best romantic destinations for newlyweds, according to Modern Bride magazine’s 11th annual survey of the World’s 50 Best Honeymoon resorts. The survey ranked Anguilla as number one overall for a Caribbean destination and number eight in the world. Italy was rated the number one destination in the world with the other top nine being Hawaii, Tahiti, Costa Rica, Mexico, France, Maldives, Anguilla, Fiji and Greece. The survey was conducted though a network of 6,000 luxury travel agents who ranked their 50 favourite honeymoon destinations and named Anguilla to the number eight spot in the world. The results appear in the magazine’s August/September issue. The Saga of Catching The Spirit for St. Maarten. SIMPSON BAY/St. Maarten--St. Maarten/St. Martin’s only helicopter service Heli St. Martin has been operational for a few weeks and is planning its official opening early November. The company has plans to acquire a second helicopter. Heli St. Martin started operations from Grand Case airport early August after the arrival of its helicopter, a Eurocopter EC 120-B Colibri, a newer and quieter type of helicopter, in July, said Vice-president Corporate Communications, Sales and Marketing Matt Sadler on Tuesday. “The reception has been great. We are ready to hit the season,” said UK-born Sadler, who runs the company with his father, mother and a few others. The official launch party is planned for the beginning of November. That is when a second pilot will be added for the high season, when operations will be increased to seven days per week. Before starting up its operations, Heli St. Martin acquired all necessary permits and certifications to comply with the rules and regulations of the relevant international and local authorities. “We are fully authorised and insured. There’s nothing we haven’t done,” said Sadler, explaining that running an aviation company was a very complicated affair in which safety and reliability were crucial. Because the Eurocopter EC 120-B Colibri is a single turbine helicopter, it has its limitations. Commercially it can only fly certain distances over water. Because of regulations, it cannot fly to Saba and St. Eustatius; only between St. Maarten/St. Martin, Anguilla and St. Barths. To expand its services and have more options, Heli St. Martin plans to acquire a second helicopter within a year and a half. Though no decision has been made on the type of helicopter, the intention is to obtain a twin turbine aircraft. That type could fly commercially and longer distances. Printed in The Daily Herald, September 6th, 2006. 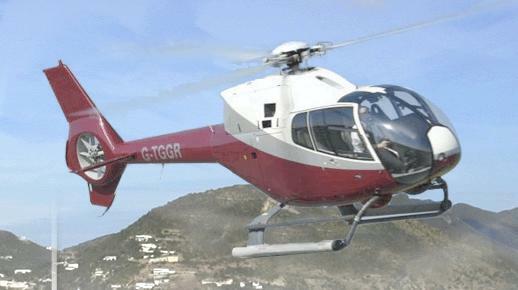 Request a flight with Heli St. Martin. Choose flights from St. Maarten to St. Maarten (island tour), from St. Maarten to St. Barths or from St. Maarten to Anguilla. Click here to request a flight.